Heat oven to 400°F. In 2-quart saucepan, heat 1 cup water to boiling. Add carrots and broccoli; cook about 4 minutes or until carrots and broccoli are crisp-tender. Drain. Meanwhile, in 3-quart saucepan, melt butter over medium heat. Add onion; cook about 2 minutes, stirring occasionally, until tender. Beat in flour with wire whisk. Gradually beat in broth and sage. Reduce heat to medium-low; cook about 5 minutes, stirring occasionally, until sauce thickens. Stir carrots, broccoli and turkey into sauce. Spoon turkey mixture into ungreased 2-quart casserole. Place bacon on microwavable plate; cover with microwavable paper towel. Microwave on High 4 to 6 minutes or until crisp. Crumble bacon; place in medium bowl. Add remaining biscuit ingredients; stir just until blended. Spoon biscuit batter around edge of turkey mixture. Bake 25 to 30 minutes or until biscuit crust is golden brown. You can find fresh sage in small bunches year-round in the produce section of supermarkets. 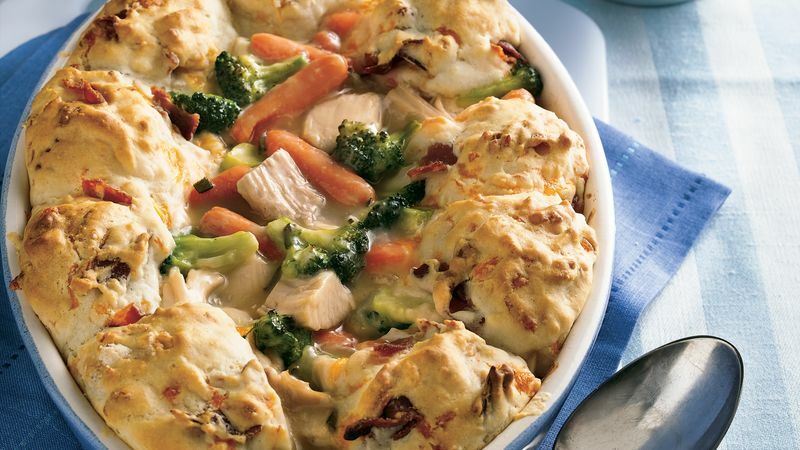 An easy biscuit topping made with Bisquick® mix tops this family-friendly pot pie.